Fashion and Event Stylist, Television Host, Fashion Photographer, Struggling Designer, PROUD PINOY, CHRISTIAN. I'd describe Ken Samudio as a charismatic accessory designer. Once you get to know him more, you'd understand where his design aesthetic is coming from. He is a kid at heart with a boyish sense of humor. I've always said that every time I see a Ken Samudio piece, it's like I want to wear it because the design is quite masculine, and yet you know that it's def. not for men (or, at least, the conventional man). Even before his PEFTA days, he has been creating and making wonderful, wearable works of arts. He is a favorite among stylists, designers, brands (yes, even brands), Filipino AND international celebrities, and fashion magazines. I wouldn't be surprised if one day, his name would be synonymous to famous international accessory designers. Now, you have a chance to bask at everything KEN SAMUDIO in this rare opportunity... a first for him, and I personally am hoping would not be the last. He will be having a sample sale of all of his creations at N + Studio in Makati (address and other information is in the posted photo). The studio will be open for four days straight, starting from December 19 to 22, 11am to 9pm. Who knows, maybe you'd be able to catch him also and have a small chit-chat with him. So for those of you who go to the studio for fittings and pull-outs, don't be surprised (or panic) if you don't see a single item of garment on those dates. They are all shoved in the dressing room and they'll return after the event, ha ha ha!!! So for all of you Ken Samudio fans out there who usually order stuff from him online, here's your chance to see a whole lot of his accessories under one roof. And what more, at very affordable JUST ON THE DATES OF THE SALE prices. 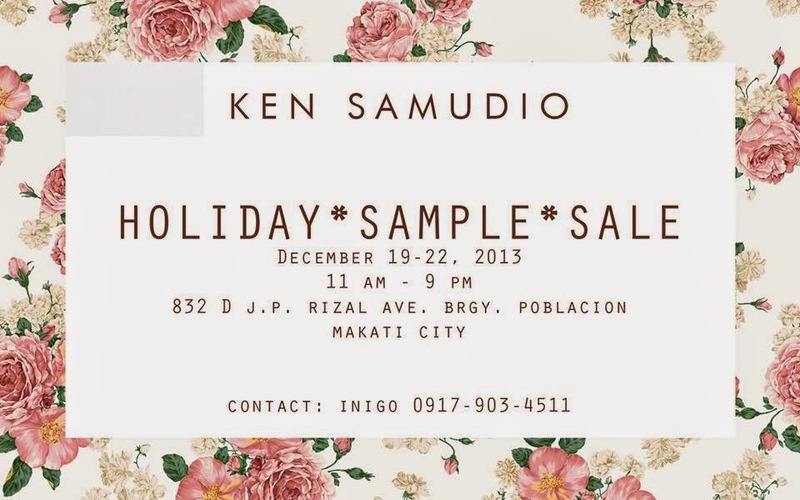 For more information about the sale, you can leave me a message HERE or contact Inigo (name and number on the poster). Hope to see you guys on those dates!!! To view the map going to the venue, click HERE. Fashion stylist, fashion and event photographer, tv host, struggling designer, proud Pinoy, Christian.